"From beginner to proficient, just by seeing me is enough"
Regarding the DApp ecosystem, especially the EOS DApp ecosystem, many people, even the EOS holders are still very unfamiliar. On December 10th, WenHao, Bitpie Wallet developer, shared a theme of “DApp Eco Booming”. From these three factors, WenHao believes that EOS is significantly better than Ethereum, and 60 points can be scored for the current EOS. Regardless of the small stages, we have gone through three main phases: the base coins led by Bitcoin and the altcoin era, the ICO era led by Ethereum, and the DApp era. Today, as a programmer, I will do some analysis from a technical point of view. We can say that Bitcoin is absolutely decentralized in terms of the degree of decentralization. Ethereum can also be said to be partial decentralized. At least until now, its PoW mechanism has made this decentralization degree higher. Of course, the decentralization of Ethereum is not as high as the decentralization of Bitcoin. As for EOS, everyone knows that it has been criticized as a database, and the EOS ECAF has the power of freezing accounts. Isn't this a crap? Here I want to highlight: is slightly different from most people. Although EOS is more centralized than Bitcoin and Ethereum, we cannot say that it is completely centralized. A partial decentralization is also decentralized. The 21 BPs of EOSall have their own decision-making and judgment. Naturally, apart from these 21 nodes, there are a lot of standby BPs behind. In general, these BPs have their own decision-making right, which means that they are independent from Block.One or BM. Therefore, EOS is not centralized in the absolute sense, but the degree of decentralization is not as high as that of Bitcoin and Ethereum. In terms of security, Bitcoin is the most secure. Ethereum had some security incidents, such as the previous The DAO Accident, which led to the fork of Ethereum, and after that the multi-signature incident of the wallet. The security of EOS is even worse due to its complexity. 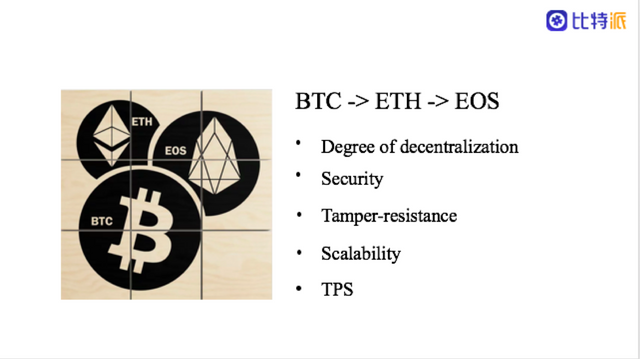 So, in terms of security, the security of Bitcoin, Ethereum, and EOS is gradually declined so are the Blockchain tamper-resistance. However, in terms of scalability, it is just the opposite. EOS becomes the best among them. For the sake of security and decentralization, Bitcoin removes a lot of scalability features; Ethereum is turing-complete with smart contracts, it has certain scalability; but EOS scalability is even stronger, it can scale to thousands of TPS and has stronger performance. The differences in these dimensions determines the different ecosystems on Bitcoin, Ethereum and EOS. Bitcoin is more like a basic cryptocurrency, Ethereum had the ICO ecosystem and EOS has recently been booming in the DApp ecosystem. Why is the Ethereum DApp ecosystem limited? There are two phenomenal DApps in Ethereum: Crypto Kitties and FOMO 3D. Why are they called a phenomenon level DApp? Because they stay popular only for a week or two, no longer than a month. In fact, there are many DApp attempts at Ethereum. Before the DAO Accident came out, there were a lot of DApps. During the 2017 ICO trend, the DApp on Ethereum increased even more. But, why there are only two phenomenal DApps these years? There are numerous teams trapped in the Ethereum DApp development. They worked very hard and did a lot of development work. But despite of that, why only two phenomenal DApps are known and remembered? The reason is mainly lying in Ethereum´s TPS and TX Fee restrictions. The DApps Boom can be analogized to the Internet boom, especially the sudden rise of the mobile Internet. If iPhone or Android phone didn´t show up, the mobile Internet will not emerge because the conditions are not in place. For the same reason, the arrival of the DApps Boom also requires certain preconditions: high TPS, close to nil transaction costs, and seamless integration of wallets. High TPS is of important significance. Bitcoin has a single digit of TPS, Ethereum has two-digit number of TPS, and EOS has thousands of TPS. At the time when Ethereum's Crypto kitties and FOMO 3D were launched, the Ethereum network was jammed for a long time, and the miners fees were more than ten times higher than before because the TPS was too low, which is almost impossible for DApp to run. Low transaction costs are also fatal for DApps. 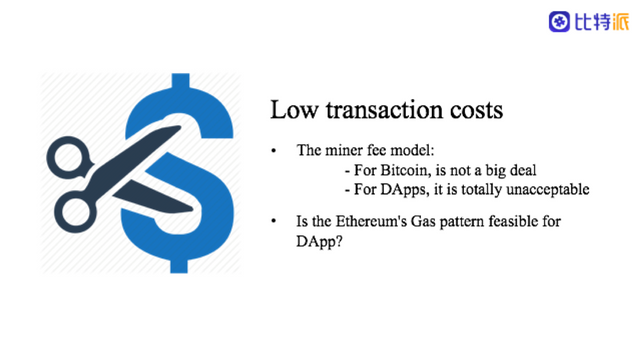 For Bitcoin, the miner fee model is not a big deal; but for DApps, it is totally unacceptable. 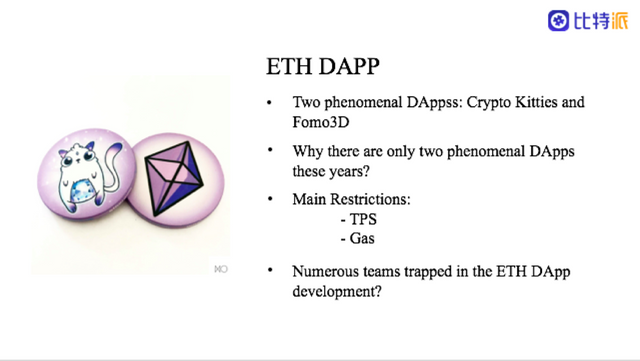 Given that, the question is that is the Ethereum's Gas pattern feasible for DApp? If large-scale DApp game comes out in the future and you have to pay for every single action, it will be very problematic. 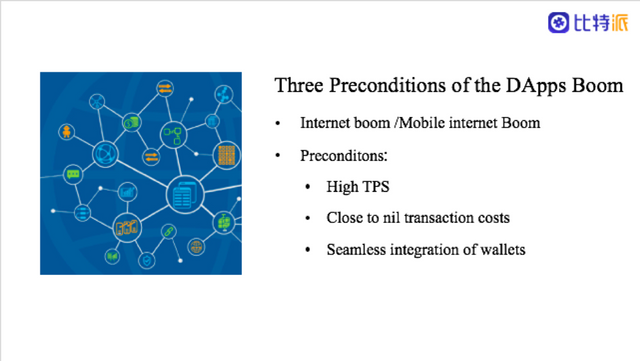 The third precondition of the DApps Boom is also a very important point: the seamless integration of the wallet. Before Crypto kitties and FOMO 3D came out, everyone used the browser plugin wallet to play. Now there is a plugin wallet, Scatter on EOS, similar to the Ethereum MetaMask browser plugin wallet. In other words, the EOS ecosystem has evolved from Ethereum. There is a plugin wallet on Ethereum, and DApp is played in the browser plugin wallet. So, how does EOS's DApp seamless integration work? Some people on EOS also works on plug-in wallets, such as the Scatter plug-in, and after that everyone follows the standard set by Scatter to seamlessly support EOS DApps. This is actually very simple. All DApps follow the standard of the Scatter plugin. Therefore, the wallet also complies with the standard of the Scatter plugin. So, the seamless integration of the wallet for the DApp is of an important meaning, just like the iPhone to the mobile Internet. From the perspective of DApp, the current EOS can be scored 60 points out of 100. 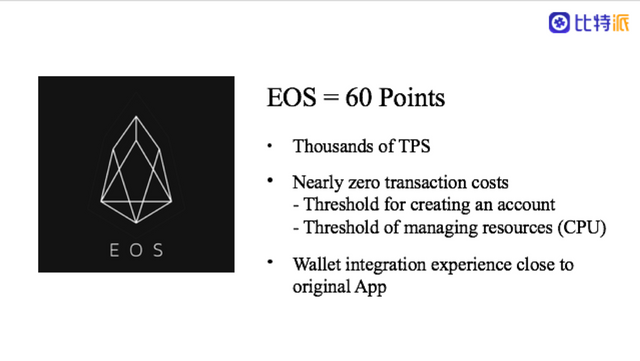 With thousands of TPS, nearly zero transaction costs and integration experience close to native apps, EOS has the basis of the DApps Boom. Certainly, EOS currently has two thresholds: the threshold for creating an account, and the threshold of managing resources. Now, these two thresholds are getting lower. Many wallets have lowered the thresholds for creating accounts, and some EOS resource leasing platforms have also been developed. You can borrow resources instead of buying and then staking them, which is much more convenient. That´s why I score 60 points to EOS. As for whether there will be a better public Blockchain in the future, I believe in that everything is possible. Ethereum smart contracts are written in Solidity, and EOS smart contracts are written in C++. Therefore, it is said that the difficulty of developing DApp on EOS is far more difficult than the development on ETH. However, after our team came through the practice, we got to an opposite conclusion: DApp development on EOS is much less difficult than that on Ethereum. 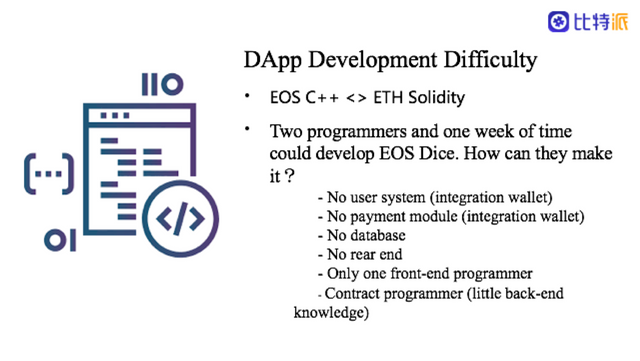 For example: EOSBet and EOS Dice, how much time does it take to develop them-- Two programmers and one week. It is very difficult to develop in the traditional world. For example, to work in an exchange platform, you must first develop a user system-- users must register with their e-mail or phone number. This system requires several programmers to spend a month, let alone the integration of the exchange platform, ordering and K-line modules. Why is it so easy to develop a DApp on EOS? The first reason is that no user system is required. Many of the DApp login buttons, you just need to click on it and it directly connects to the account balance in your wallet, so you can log in directly. The second reason is that you don't need a payment module, you can directly package and invoke the Scatter wallet payment module, and all other wallets will support it. The third point is that many DApps do not need a database, because the data is directly on the chain, as long as the random number is maintained in the contract. The fourth but not least is that most DApps don't require a rear end. Of course, rear end is still needed when making complex games. Consequently, one excellent front-end programmer plus a contract programmer with a little back-end knowledge can make a DApp development similar to EOS Dice in a week. After the difficulty of DApp development is reduced, the threshold for entering this ecology will also become lower. This is why, starting from September, in just three months, a large number of EOS DApps have emerged, and many are really popular ones among them. Of course, the above mentioned is only the antecedent of the EOS DApps Boom. Let’s talk about the currently popular EOS DApps. The first is EOSBet, which ignited the EOS DApp boom. This DApp team started development in Ethereum last year. For more than a year, the development of their products has been stuck. This year they started by switching to EOS, but surprisingly they succeeded with their first product. EOSBet has been hacked twice because of smart contract vulnerabilities; but because the funds in the bonus pool are enough, the team undertook their own losses caused by the hackers. Of course, two hacking incidents led to a decline of its credibility among users, giving the latter DApp opportunities. BetDice, it debuted around the Chinese National Day that it began to boom. From operation strategy to the efficiency, they did a very good job. What’s more, they were the first ones to introduce the Token model-- a dividend payout per hour. This incentive strategy is very powerful, that is why it is still the head of the DApp so far. EOSPoker. The team was very small at first, and the product was not excellent when it was firstly launched, but they kept upgrading and as a result they accumulated a lot of users. From then, their token price and the dividend payout have been very stable, and it has a robust growth up to now. EOSJacks, a phenomenon-level product, became a top DApp in just a few days after debut. However, due to subsequent iterations and strategic mistakes, it lost its players in a few weeks. MEV, who previously invested a lot of work in Ethereum, but later shifted to EOS. There are also DApps such as BigGame and FunCity, which are increasingly moving towards immersion-style games. So, this market is particularly sensitive: if you do the right thing, you immediately get reward from the market; but if you do the wrong thing, you will be punished through it. Today, the EOS Ecology has only a few thousands of DAU while it has emerged so many DApps and excellent teams behind them. No doubt, many people say that DApps on EOS are almost gambles. In fact, it's just because the game-natured DApps take more time to develop. Of course, in this case, a front-end programmer and a contract programmer with a little back-end knowledge are not enough. Now, let's talk about another type of DApp in the EOS ecosystem--decentralized exchange platform. If you really go into the EOS ecosystem, you will know that the EOS ecosystem does not require a centralized exchange platform. For example, if a user plays a "gambling" DApp and wins a lot of the DApp's Token, he is likely to stake part of those tokens and receive the dividends, and the other part will be exchanged directly to EOS through the decentralized exchange platform. Decentralized exchange platform on EOS are seamlessly integrated by many wallets. The experience is not much different from many centralized exchange platforms. Next, I will generally talk something about EOS Resources, such as the frequently-occuring CPU shortage. Recently, many EOS resource leasing services have been launched. In order to play a Dapp, you don't need to buy a large amount of EOS and stake them to get resources and unstake them to get them back when you are not playing. Now you can borrow it directly, the price is fairly cheap, cost-effective and convenient. These P2P decentralized EOS resource leasing services, such as Chintai, although the current user experience is very poor, but the daily activity is extremely high, it has large amount of users. Finally, I’m going to talk about Bitpie’s efforts in EOS. As mentioned above, for current average users, EOS has two thresholds, creating thresholds and resource-managing thresholds. In addition to the complete and seamless integration of DApp functions, Bitpie Wallet is constantly helping users by lowering these two thresholds. For example, Bitpie wallet has launched services such as creating an EOS account, EOS/Fiat buy and sell and EOS lease with fiat. In addition, Bitpie also launched (*)EOS-based stable coins: EBTC, EETH, EUSD at Dec.12 2018. At present, users can only swap these stable coins at Bitpie wallet. 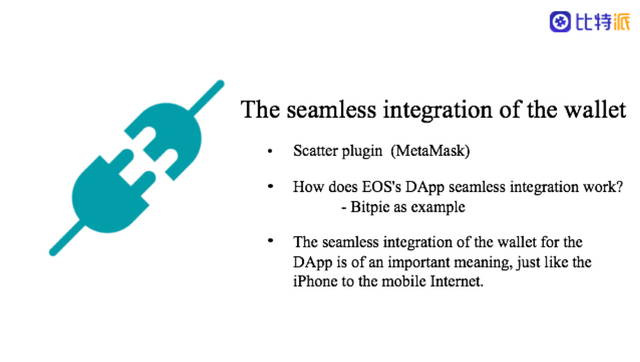 However, in the future, Bitpie will open the API for the partners (exchange, games and wallets) to integrate the Swap Access on their platform, in the hope of make our own contributions to the EOS ecosystem. At present, Bitpie Wallet has become an important entrance for the cryptocurrency world, the Blockchain world, and even for the users outside the world welcoming them to enter the EOS world. In the future, Bitpie Wallet will continue to invest our all kinds of resources to help the bigger boom of the EOS ecosystem. The 3 stable coins are 1:1 pegged to BTC, ETH and USDT respectively. Users swap original blockchain assets to http://EOS.IO through gateway service so as to utilize them in DApps or DEXs. They could be the game changer in the dapps ecosystem.